The dietary supplement Celadrin® has been developed to improve daily life for those who suffer from joint pain. The result of many years’ research, this pain relief formulation consists of a patented blend of esterified fatty acid carbons: myristic, myristoleic, oleic, palmitoleic, palmitic, lauric, decanoic and stearic acids. Obtained via esterification, these fatty acids have been combined in a single supplement to reduce inflammatory responses, ease joint pain and protect the joints. The efficacy of the patented complex Celadrin® was demonstrated in a multi-centre, double-blind, placebo-controlled study of subjects with arthritis of the knee. Published in the prestigious Journal of Rheumatology, the study revealed reductions in joint pain and improvements in knee mobility in those given oral Celadrin®. The supplement’s benefits were observed in a number of everyday activities: getting up from a chair, standing, walking and climbing the stairs. Studies carried out on esterified fatty acid carbons have demonstrated multiple anti-inflammatory effects in the body. These compounds reduce the pro-inflammatory effect of arachidonic acid and inhibit inflammation in the endothelial cells that line the interior surface of blood vessels. They also appear to control mediators of the inflammatory process such as interleukin-6 (IL-6). With its unique content of esterified fatty acid carbons, Celadrin® thus has a powerful anti-inflammatory action, and as a result, offers therapeutic benefits in relieving the inflammatory pain associated with osteoarthritis, rheumatoid arthritis and tendonitis. In addition to their anti-inflammatory properties, esterified fatty acid carbons also offer benefits in maintaining and strengthening the joint membrane. Celadrin® offers the perfect combination of lipids for supporting, boosting or restoring the structure of this membrane. Its protective effect helps increase the viscosity of synovial fluid. Produced by the synovial membrane, this fluid is important for the health of the joints, cartilage and bones. For example, it helps lubricate the joints, prevent friction between bones, cushion shocks and provide nutrients and oxygen to cartilage cells. Celadrin® is the perfect supplement for fighting joint pain. Its unique combination of esterified fatty acid carbons helps reduce inflammation, relieve pain and protect the joints. It also offers the advantage of being developed from natural ingredients, free from any side-effects. 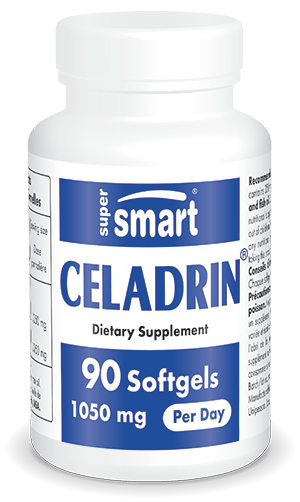 The benefits of this proprietary blend are available in the form of the nutritional supplement Celadrin®, with a suggested dose of three soft gels a day. For relief from joint pain, this essential nutritional supplement can also be combined with topical application of Celadrin® Forte Cream. You may also be interested in other supplements that provide relief from joint pain such as Super Boswellia, developed from a plant renowned in Ayurvedic medicine. Other ingredients: soya* oil, salmon oil. *Genetically-modified soya extract. Celadrin® , Imagenetix, USA.